Students and families whose first language is not English are supported and provided services through the District’s English Language Learner Program (ELL) program. All qualified students are served at their neighborhood school through a combination model of instruction and consultation. Students participating in the ELL program are expected and supported to achieve the Washington State performance standards. The initial screening process for determining ELL eligibility includes an evaluation using the Washington English Language Proficiency Assessment (WELPA). The WELPA test evaluates the reading and writing English proficiency of each ELL student. In addition, all currently-enrolled ELL students will be tested using the Washington English Language Proficiency Assessment during the spring of each school year. 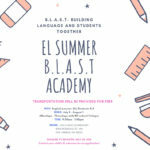 Check out the summer BLAST Academy!